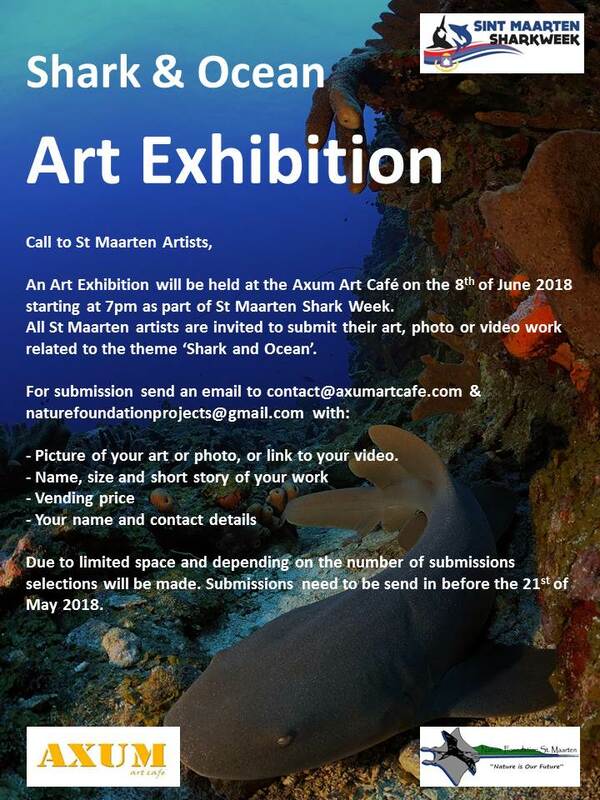 The St. Maarten Nature Foundation and Axum Art Café invite all St. Maarten artists to submit their Shark and Ocean themed Art work for the Art Exhibition. The St. Maarten Nature Foundation will be organizing the first Shark and Ocean themed Art Exhibition at the Axum Art Café on the 8th of June 2018 as part of St Maarten Shark Week. The Art Exhibition will be the kick off of this year’s Shark Week, which will be held from the 8th until the 16th of June 2018. Sharks are the most misunderstood species on the planet as they are repeatedly displayed as villains and being dangerous; however they are actually the victims of humans poaching, finning and overfishing. Worldwide over 100 million sharks are killed per year resulting in half of all shark species being threatened or endangered. It is important that we work together to ensure the survival of our shark populations, therefore the Nature Foundation is trying to bring this awareness to the public by organizing Shark Week. We are very pleased to partner with the Axum Art Café in Phillipsburg in order to stimulate art work on our island and educate people about sharks. Therefore we invite all St Maarten artists to submit their work related to sharks and our ocean for this exceptional art exhibition. The Axum Art Café offers local cultural activities such as live music, art exhibitions and performance arts, visitors can relax and appreciate art from St Maarten at our café. Partnering with the Nature Foundation gives us the opportunity to show art work related to a theme which have not been exposed before. 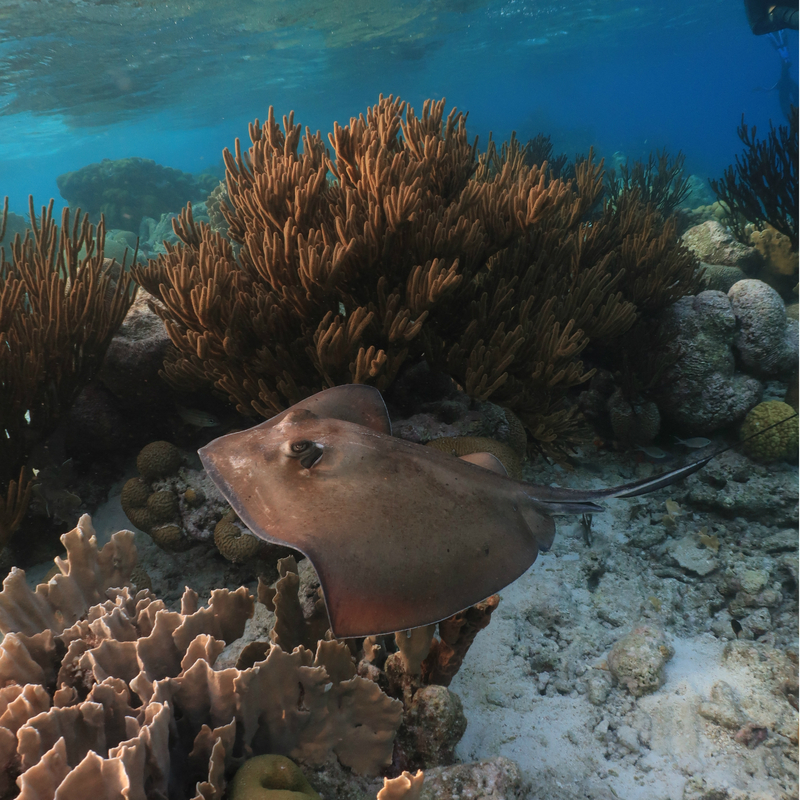 We think it is a great opportunity to showcase the beautiful underwater world of St Maarten using local art work. All St Maarten artists are invited to submit their art, photo or video work related to the theme ‘Shark and Ocean’ for submission an email can be send to contact@axumartcafe.com and naturefoundationprojects@gmail.com with a picture of your art or photo work; name, size and short story of your work; vending price and your name and contact details. Submissions need to be send in before the 21st of May 2018.